One of the best things being abroad is to explore the local delicatessen. I roamed through the narrow streets in Sitges. Here there are no large supermarkets, rather small green grocers, fish mongers and butcher's shops. This would be the place to live, as you could enjoy Spanish delights every day. I found a small delicatessen in one of the narrow streets. 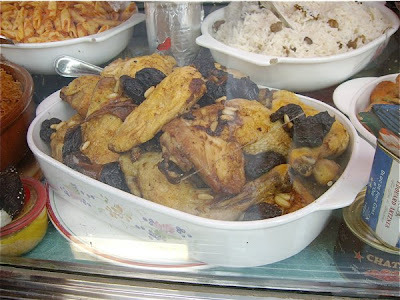 I stood outside and wondered what dishes were displayed in the window. This is the difference between Spain and Norway. In Spain they show off, in more ways than one. 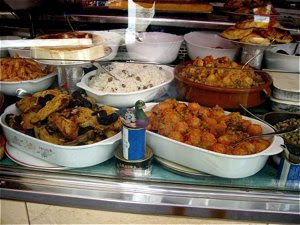 They proudly present their food in their window for every hungry tourist to see. I remember walking around in Barcelona in June, last year, seeing cured ham and fresh seafood exhibited in many a small tavern and delicatessen in the narrow streets of the old city. When I see this picture I think of a classic tapas - albondigas. Small spicy meatballs, packed with garlic and any kind of Mediterranean herb you could think of, and served in a sauce made with aromatic Spanish tomatoes sweetened by the hot sun. I do not know whether they taste as good as they look. 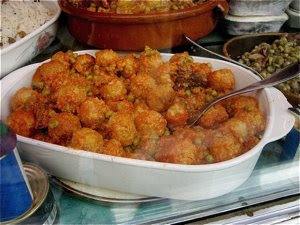 At Pescaditos in Sitges we were served albondigas that disappointed us deeply, reminding us that even Spain has its bad cooks. In Sitges there may be more of them, as it is a tourist trap, at its worst. But the little blue tin beside the dish - foi-gras from Eduard Arzner from Strasbourg may be a promising sign that the food here is on the highest level. 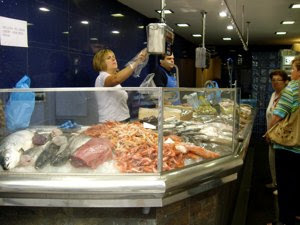 Another attraction along the shores of the Mediterranean is the fish mongers. In another narrow street in old Sitges I found this small fish monger offering fresh fish and crustaceans. Here I saw large pieces of fresh, dark tuna meat, sadly from a species threatened by overfishing and extinction. 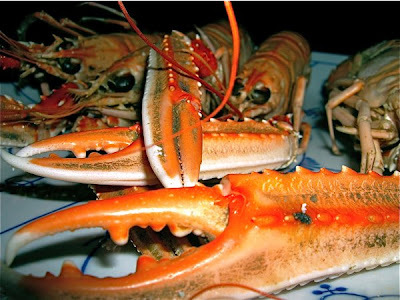 Langoustines, Dublin Bay Prawns or Norway Lobsters - a delicious treats with many names. Cut them in two, add fresh pesto, garlic and parmeggiano and bake in the oven. Wikedly good - what tucka' as the naked chef would have said.